The Lattari mountains are described in additional detail at this link, but basically they are the spur of the Apennines that stick out into the Tyrrhenian Sea to form the Sorrentine peninsula (image right), dividing the gulf of Naples (top) from the gulf of Salerno (bottom). The mass of the Lattaris is about 35 km (20 miles) long, pointing directly at the island of Capri and only about nine km (5+ miles) wide at the base of the bulge, where the hills rise out of the Vesuvian plain. That pass behind the Lattari bulge runs from Pompei to Salerno (port visible far right) and is one of the most storied invasion routes in history. Geology has folded the hills above the Amalfi coast, pleating them like an accordion, to produce a remarkable series of valleys running down to the sea. One of them runs right into Amalfi (yellow dot in image). So the hardest and loveliest way to get to Amalfi is to come in and up from the invasion route: just a short distance from Pompeii along the A3 autostrada, turn off and up as if going to Ravello (also in that yellow dot). It's a short steep climb up to the top and then it's all downhill; turn towards Ravello and then to Scala, a small town across the valley from Ravello. Part of Scala is called Minuta. A trail starts there that leads steeply up to a ridge (the edge of one of those accordion pleats!) 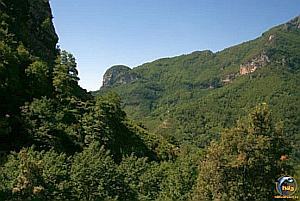 and over and down along the Valle delle Ferriere (lit. Valley of the Iron Foundries—don't worry, Mother Nature has reclaimed it). You will pass through a Nature Preserve (455 hectares/1100 acres) part of the overall Lattari Mountains Regional Park, streams, chestnut groves, medieval churches, and relics of the iron works that served the Republic of Amalfi 1000 years ago by supplying nails for the ships (Amalfi was one of the four Italian maritime republics). 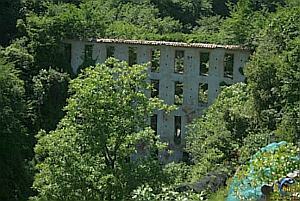 The valley is also known as the Valley of Mills after the water-powered mills that once produced the paper that Amalfi was famous for. You'll even pass a long “window wall” (pictured right) where paper was hung to dry. 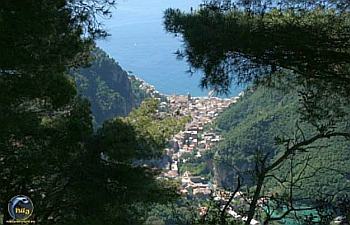 All the while, you are descending on Amalfi from the hillside. You'll know it when you get there. You'll see a lot of people who took the easy way. 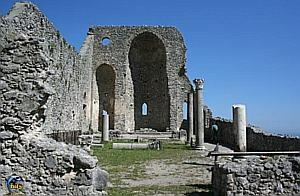 There are a few alternatives to this route: about halfway down, you'll pass through a populated center called Pontone. You could have started there without worrying about invading the mountain range from the rear because you can actually get a bus to Pontone, get off there and continue down on foot, having avoided the climb over the ridge higher up and the upper part of the trail. You can also get a bus from the bottom back up to Scala or Pontone. But then you miss a lot of exercise. If you crave the pounding in your chest that says you're crazy, note the stairway at Pontone. It goes directly down to Amalfi, only 2000 (!) steps away. Don't do that. 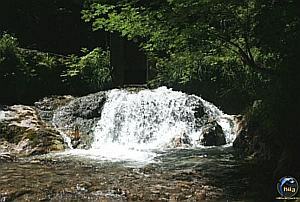 Keep to the trail and enjoy the hike down. You can, however, walk back up the stairs. Photos are from Napoli Underground (NUg). They walked back up the 2000 stairs! Their story and more photos here.